Let’s just forget last week ever happened, shall we? The Double U-Turn is here to rescue the season with a little manufactured drama. Hey, any kind of drama at all is welcome at this point, and the last 10 minutes of this episode are as good as it’s gotten all season. We begin in Surabaya, Indonesia, where the twins are first out of the gate, now with the Express Pass in hand. The first few teams are bunched together closely, and it looks like the Sri Lanka/Texas alliance has now added the Chippendales to the roster. The value of alliances in this game is dubious at best anyway, and I’m not sure adding a third team is the best idea, but these things are pretty fluid on The Amazing Race anyway. In any case, all of this bonding doesn’t prove to be especially helpful to the twins, who get lost on the way to the first task. The Roadblock involves serving 20 plates at once in a Padang restaurant, and you know what that means: Things are going to break! Indeed, several of racers drop big armfuls of plates and food on the floor, which results in a round of applause from the assembled diners. It’s fun to watch your food hit the floor! At some point during this task, Caitlin and Brittany speak, and it occurs to me that I don’t remember seeing them at all last week and had completely forgotten they were on show. And thus, it is at this relatively early juncture that I realize they are toast. After completing the task, teams must board a train for Bangil. Five teams make it to the first train, not including the twins, who just miss it. The next train doesn’t depart for more than three hours, which means they’re about to get stuck with the stragglers: the monster truckers, the blondes, and Gary and Will (or Team Sweat as I dubbed them after watching their green t-shirts turn to swampland during the course of this episode). The Detour, Lion’s Head or Egg Head, was a bit of puzzlement. I could not figure out why anyone would choose to march and dance while wearing a 40-pound lion’s head instead of simply sitting still while eggs were being fried on their heads. It’s not as if their actual hair was being set on fire; they merely had to hold burning coconuts on their heads—and who among us has not done that during our college years? Plus, afterward, they got to eat delicious eggs! It looked like a win-win situation to me, so I can only imagine teams had reason to believe that task was too far away or too time consuming. The five teams that had been on the first train all chose not to use the U-Turn, and dating divorcees Abbie and Ryan (who are still in the running for $2 million) finished first, establishing themselves as this season’s frontrunners. At the back of the pack, the monster truckers U-Turned Will and Gary, who hardly seem to need much help in doing poorly at the Race. Case in point: Will and Gary decide to U-Turn the monster truckers, who have already passed the checkpoint. I realize this is just a bad guess on their part, as they weren’t sure who was still behind them, but it just shows that, in addition to their poor racing skills, luck is not on their side. Or is it? As it turns out, the blondes are having trouble with their driver. I know I complained about taxi-related luck last week, but it’s hard for me to feel to sorry for them, especially after Brittany says, “It’s so frustrating when a guy from this country can’t speak English!” Or maybe he understood just enough to take a wrong turn at the last fork in the road, thus sparing Team Sweat from elimination and sending the blondes home. At least, that’s what I choose to believe. 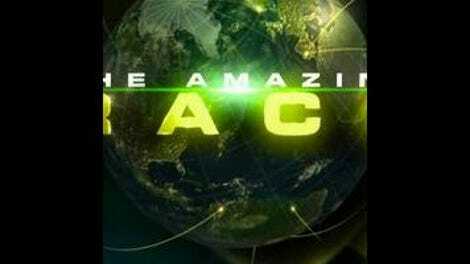 The goat farmers are apparently under the impression that great people usually win The Amazing Race. I’m not sure history supports that conclusion. 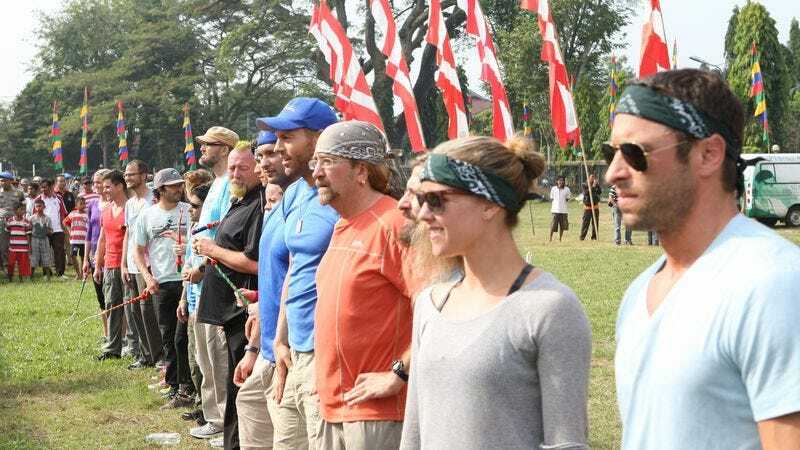 When it became clear that teams would have to perform dance moves during the Lion’s Head task, I had flashbacks to Team Holler’s struggles last season. Fortunately, the dance moves were not particularly intricate. Let’s have more of the Chippendales crammed into tiny modes of transportation, please. According to the helpful TAR subtitles, “Hai” means “Hello.” I would not have guessed! The U-Turn was anonymous this time. I’m not sure this is a great idea, but maybe it will stir up some paranoia and unnecessary bad blood between teams. Next time: Rob yells, “You just cost me a million dollars!” Nobody cares, Rob.